By 1892 the rapid increase of rustling in Wyoming had prompted the Cattlemen's Association to take matters in their own hands and deal with the problem in a violent manner, hiring men they called "Range Detectives", but which, in truth many were no more than hired killers. Caught in the fury of this range war were two cowboys living on the Greybull River in the Bighorn Basin. Having been accused and arrested for rustling by three "range detectives", they were taken before a judge in Johnson County who promptly dismissed the case because the alleged crime was committed in another county. On their way home from court, they were stopped at the Bighorn River crossing by the same "detectives" and arrested again, this time for causing a disturbance in the courtroom. 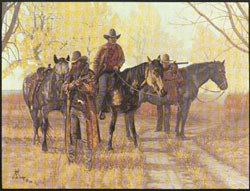 On this charge they were sentenced to serve time in the county jail at Buffalo, Wyoming, a penalty they would never serve. While being escorted to jail, by the "detectives", they were shot down in cold blood, unarmed and tied to their saddles. Thus ended the lives of Jack Bedford and Dab Burch. Exclusive issue of only 250 signed and numbered artist's prints at $250.00 each. Image size - 18" X 24". This painting was used on the cover of the book "Blood on the Moon" by Chip Carlson.